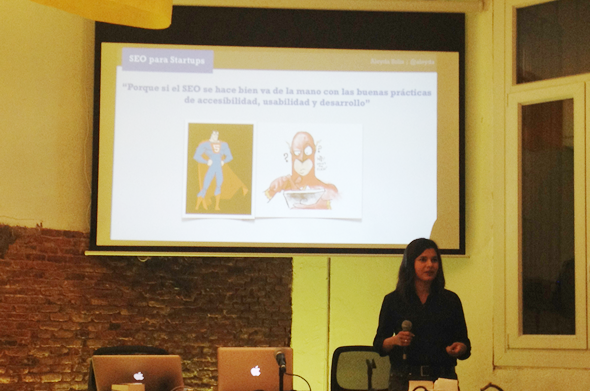 Last friday I had the opportunity to give a presentation about SEO for Startups in Betabeers, the web developers event / meetup that started some time ago in Madrid with a lot of success and it is now organized in multiple cities. The presentation goal was to show the opportunity that search engine optimization represents to entrepreneurs with a technical profile and introduce, more than the operative aspects -that in good part can be easily implemented if you have development knowledge- the importance of taking SEO into consideration when you are creating a product and the strategy to do it in the most transparent way, making the most out of the startup characteristics. In order to achieve this goal I first clarify some “myths” about SEO and then show the opportunity that developing a search engine friendly platform represents, taking SEO into consideration from the start as a “non-functional requirement” in the project. I later present how search engine optimization can be an ideal online marketing strategy for startups with creative and innovative web based projects, that can make the most out of it at a relatively low cost in comparison to other strategies, since SEO goes much hand in hand with usability, accessibility and development good practices as happens with a good content and social media strategy. Furthermore, SEO can be totally measured and is focused on conversion. You can also see the presentation in slideshare with a bigger resolution and if you speak Spanish and have a little bit of time you can also take a look at the video here (my presentation starts at minute 12). I hope that as an entrepreneur or developer you take SEO into consideration early in your project and make the most out of its potential benefits, otherwise if you start optimizing late, it can be far more complex to do it (a lot of the sites that have the bigger optimization restrictions are those that when developed didn’t take SEO into consideration and their platforms are not scalable nor flexible, and most of the times also not very usable and accessible). If you have a startup and has already make the most out of SEO to maximize the visibility and conversions of your product or service I would love to know your experience: comments are welcome! You got a very interesting presentation here. It is really so nice to know that you were able to present how search engine optimization can be an ideal online marketing strategy for startups. I will definitely share this post of yours to my friends.